The family taxi company in Lowestoft, you can trust. Founded in 1987, Five One Taxis in Lowestoft are the Taxi company you can trust and are proud to be the largest fleet of taxis in Lowestoft and the local area. As a family run business we pride ourselves in great customer service, trustworthy drivers and prompt service across Norfolk and Suffolk. Alongside local taxi journeys we can also provide a long distance taxi service, including transfers to airports. Group travel? No worries, Five One Taxis own 10 minibuses which can be booked for transfers, airport runs or simply to get you from A to B. You can be sure that by choosing Five One Taxis, you will be receiving a friendly and reliable transport service. Call us on 01502 515151 for a taxi service you can rely on. All prices quoted using our app are fixed, so there will be no nasty surprises after your journey. It’s easy to pay for your journey too, as you can pay directly using a credit or debit card. If you are an account holder, you can also use the 515151 app for quick and easy taxi bookings. 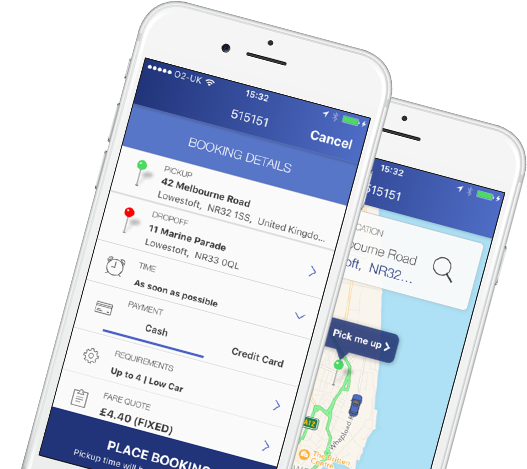 Download the app free of charge, and you will be able to book your taxi, monitor your bookings and track your taxi, whilst it is on its journey to you. Our accounts system is integrated within our Autocab computer system, it provides ease of use for both the user and client. Invoices are sent by email to our clients they can contain as little or as much information as required, for instance it can be as simple as detailing pick up and destination or the addition of information such as name, reference’s po number’s etc. This is something that we can tailor to suit our clients. Statements are also sent alongside statements showing a clear precise statement of what is outstanding. We are able to offer additional security features such as a pass worded protected account offering peace of mind that named staff or staff with a password will only be able to make any bookings. Due to the integration of our booking and accounts system it means we are able to hold all information regarding each booking, from when and how the booking was made, any modifications or additional information, and even the phone call associated with the booking. We have an assigned point of contact who manages our accounts at Five One Taxis who is able to discuss or answer questions with your account and is available both by phone or email, she has now been with us for over 10 years and has extensive experience of both invoicing and managing accounts.